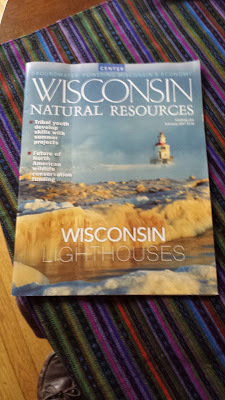 Word began circulating on February 9th that Scott Walker's upcoming state budget would wipe out his 'chamber of commerce mentality' DNR's popular, subscriber-supported magazine. Last but not least is the much-awaited update to a popular groundwater insert - "Groundwater: Powering Wisconsin's Economy." It is introduced by "A peek beneath the surface," taking readers into Wisconsin's basement to discover the aquifers that hold and transport our groundwater. Is that current February issue (the venerable publication comes out every two months) just too darn useful and attractive - - note that subscriptions are booming? I'm honored and pleased to introduce our very popular groundwater insert for Wisconsin Natural Resource magazine's February 2017 issue. Over the years, we've seen interest in this document grow - - this is the fourth edition of the insert since its first release in the 1980s, and every time it comes out our readers snap up the thousands of copies we print. That speaks not only to the great following our magazine has but also to how much our citizens care about safe, clean drinking water for everyone in the state." "Recycling our waste is a great way to keep the air clean. Life cycle analysis of waste has shown that recycling common things, such as paper, cans and bottles, significantly reduces air emissions overall. A great example is the aluminum can. Recycling an aluminum can save 95% of the energy used to make aluminum out of virgin bauxite ore. Recycling other metals, paper, plastic and glass also saves significant amounts of energy. Visit EPA's WARM [exit DNR] tool to calculate your own recycling emissions savings." Gov. Scott Walker is proposing cuts in his budget for recycling, a move that represents more than a 50% reduction in funding to communities over a five-year period. In the two-year budget he unveiled on Feb. 3, Walker proposed $15 million in state spending for local recycling programs. Seriously, WI DNR. " "Recycling our waste is a great way to keep the air clean...recycling common things, such as paper, cans and bottles, significantly reduces air emissions overall...Recycling an aluminum can save 95% of the energy used to make aluminum out of virgin bauxite ore. Recycling other metals, paper, plastic and glass also saves significant amounts of energy..."
How much you want to bet the article about commerce and groundwater ties growth in Waukesha County - the Region - with Waukesha on. a Lake Michigan water supply? Her little beginning letter to the groundwater economy piece doesn't seem to fit with the article itself. Almost as if she were writing about a different article.